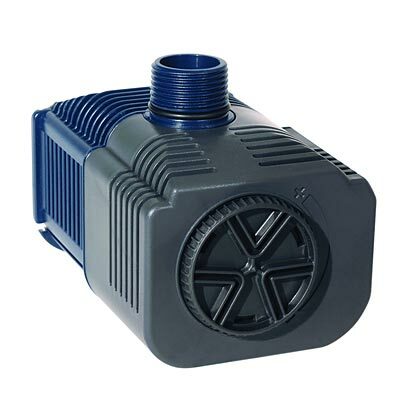 Circulate water throughout your small pond using the Pentair PRO Series Model 3000 Fountain Pump. This magnetic drive pump offers maximum quality and efficiency, perfect for creating a small fountain or waterfall in your water feature. The hardy, plastic body keeps the unit durable and water safe, and the pump may be used either submerged or inline. Improved shaft materials, corrosion resistant bearings, and combined rotors form an innovative impeller, which moves up to 758 gallons of water per hour with minimal energy consumption. The screened front of this unit is fantastic for submerged use, and its flow control dial allows you to alter the water flow as desired. The front, screened cover may be removed for pump maintenance, or to plumb the unit and use it inline rather than submerged. The top outlet accepts 1" FNPT fittings, or attach the included, barbed adapter for use with 3/4" or 1" tubing. The 20' long cord offers a variety of placement options, and the plastic body of the pump withstands use for many seasons. Continually power your pond fountain using this PRO Series Model 3000 Fountain Pump. Three year limited warranty.